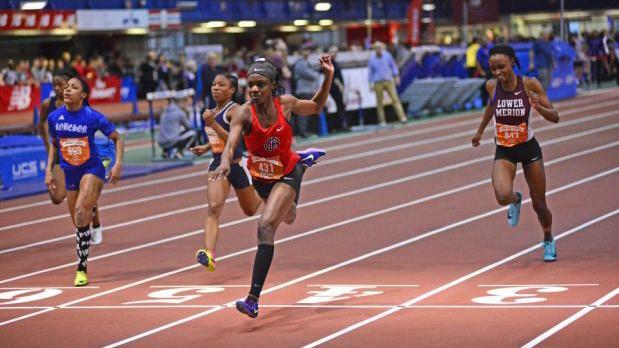 Pennsylvania's top sprinters took centerstage at the Armory this Saturday and there were, of course, some fast times. In the 55 meters, Germantown Academy freshman Moforehan Abinusawa impressed in her first national-caliber meet. Abinusawa ran away with the 55 meter victory, clocking a time of 6.89. That improves upon her previous PR of 6.95. She reamins at US#1 as the only girl in the nation to have run sub-7 seconds in the event. Thelma Davies of Girard College made her season debut, running the 200 meters later in the day. The senior and LSU recruit looked strong in her season opener, blasting a 24.07 to take the win in the finals. On the young season, Davies sits at US#3. Abinusawa went 24.99 in the 200 prelims, but did not run in the final. We never got a chance to see the first matchup between Davies and Abinusawa, but surely it will come soon. Regardless it was a great Saturday for PA's top sprinters. It was yet another big day for Perkiomen Valley's Christina Warren. The senior claimed a pair of wins on Saturday. Warren matched her very own season best in the 55-meter hurdles, running 7.95, just as she did at the Marine Corps Holiday Classic a week earlier on the same track. After some quick times, by VA and MD talents, Warren sits at US#4 in the event. She remains at PA#1 in the 55mH. In the 400 meters, Bria Barnes continued her hot start to her senior season. The Iowa State-bound sprinter from Cheltenham earned a convincing win in the 400 meters, running 55.93, which slots her in at PA#1 and US#6. Penn Wood's Elicia Moore was second in 57.48, a PA#5 time. Great Valley's Amy Willig looked sharp in the 800 meters, running 2:18.40 (PA#3) for second overall. In the mile, GA's Isabelle Goldstein took second in 5:05.94 (PA#3), while Academy of Notre Dame's Jessica Schneider was third in 5:07.18 (PA#5). Germantown Academy's Meaghan Toscano launchd a big indoor PR, throwing 43-7.5 to win the shot put. That throw is good enough for a PA#4 and US#5 (evidence of how strong the event is in PA this season). It's also just over an inch behind her all-conditions PR in the event. Danielle Heine of Abington Heights took third in the pole vault with a PA#8 clearance of 11-6. Norristown's Austin Montgomery took over the state's top spot in the 55 meters, running a time of 6.46 in the finals to take third overall. Harry S. Truman's James Koliyah ran 6.64 to take seventh in that final. Koliyah also ran 22.90 in the 200 meters during a busy day. Harry S. Truman also ran a PA#4 time in the 4x200, clocking in at 1:32.29. Saint Joseph's Prep's Salim Epps was second in a tight invitational 400 meters. Epps went 49.38, a new PA#3. Girard College's Donovan Sanders wasn't far behind taking third in a PA#4 time of 49.76. Cole Peterlin of Perkiomen Valley continued his consistent season, taking first in the high jump with a clearance of 6-6 (his season best and PA#1 is 6-8). In the long jump, Upper Dublin sophomore Jaden Price-Whitehead had a strong day, taking second with a leap of 22-9.5, which ties him for the top spot in PA. Germantown Academy's Olatide Abinusawa took second in the shot put with a toss of 55-3, a PA#5. Patrick Theveny of Penncrest ran a PA#1 in the 2 mile, taking seventh in the field in 9:47.32. Penn Wood took second in the 4x400-meter relay, running a PA#3 time of 3:27.08.